I love DIY project kits! I love them even more when they encourage kids to learn more about electronics than just how to turn them on. 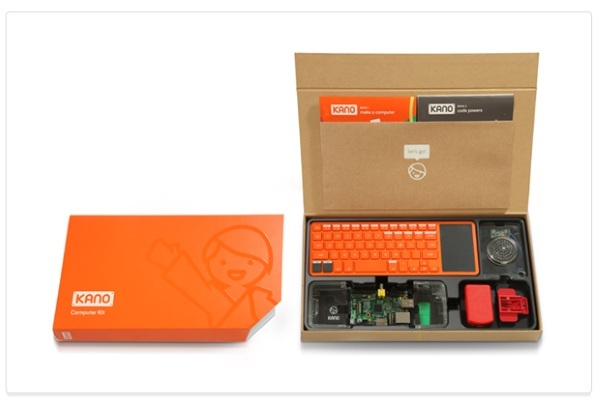 The Kano computer is a DIY computer that’s designed to help children learn how to build and code. We’ve seen build it yourself laptops but this is an actual computer, you’ll have to provide your own monitor. This computer runs on Raspberry Pi and you’re responsible for building every bit of this little machine. It does come with an open source OS and Wi-Fi. You can also print out new cases and apply stickers to it to make it all yours. As soon as you’re done building this machine, it prompts you to start learning to use it through a variety for “games” that help you learn to code. It does this by providing you with familiar games that help you (or your child) learn simple coding techniques that will allow you to do more and more with your system. The Kano is $149. This looks great. A bit pricey maybe.